Wasn't this supposed to be another Lady Gaga episode of "Glee"? Other than singing "Born This Way" at the end of Tuesday night's episode, there was very little Gaga. Instead we got 90 minutes of action which I believe could have easily fit into an hour. First, Rachel got her nose broken by Finn (really, wasn't it enough that he broke her heart?) thanks to his klutzy dance moves, and she's off and running with a plan to get a nose job. But not just any old schnoz – she wants Quinn's nose, which I guess was supposed to be symbolic of her wanting Quinn's man, who used to be her man, after he was Quinn's man first. That is to say, she really, really wants Finn back and thinks having a cuter nose will help. Or at least, that's my diagnosis. This all brings us to what the night is supposed to be all about, which was self-acceptance. Along the way, Quinn runs for prom queen, Emma sees a therapist for her OCD, Santana blackmails Karofsky into becoming an anti-bullying advocate and her beard by threatening to reveal he's gay, and Kurt returns to McKinley High. See how easily I summed that up? The show's writers could have done just that with their script, but that wouldn't have allowed us 5,400 seconds of life lessons. When Kurt tells Karofsky "You need to be educated" while in essence blackmailing him into starting a group for friends and family members of gay students, I felt like he was really talking to the audience. Not that I didn't enjoy some of the Broadway-esque after-school special moments. 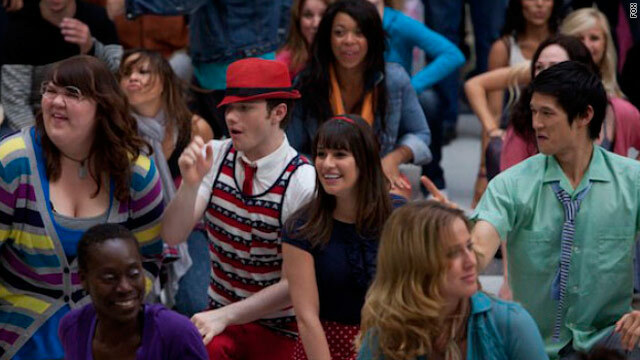 Who wouldn't want a friend like Kurt, who can stage a flash mob in a mall to convince Rachel to follow her idol Barbra Streisand's lead and leave her nose alone? And while much was made of Quinn and her run for prom queen - which Lauren tried to thwart by uncovering the fact that she is really the formerly overweight, unattractive Lucy Quinn Fabray a.k.a. Lucy Caboosey - I felt like the night really belonged to Santana. She embraced her inner lesbian (sort of) and rattled off the best likes like “The only straight I am is straight-up b-–.” You gotta love that. With everything going on during the episode, I almost forgot to mention the music. I enjoyed Quinn and Rachel's mash-up of "I Feel Pretty" from "West Side Story" with TLC, but I really loved The Warblers serenading Kurt goodbye with “Somewhere Only We Know” by Keane. I just hope it doesn't mean we will see less of Blaine. What did you think of the latest episode of "Glee?" Next entry »'Showbiz Tonight' Flashpoint: Did Trump just get a reality check? Doesn't Lady Gaga have a Va P P? lady kaka needs to get off stage! !she looks more alien than human. Lady Gaygay is just so sad. Trying harder and harder to be happy when sho knows it will all be over soon. She has run out of ideas and is starting to repeat herself. hurry up and get off! I love Glee! they should show boys kissing every episode! makes my thing stand up and makes my back door tingle! oooh I'm soooo naughty! Glee and Gaga – both need to be bullied. We ain't that into gaga. We like ganja, though: Not really into glee after "the kiss". yuck! Just ok. I would prefer more Gaga. I've been a big fan of both, but Gaga' s greatness only soars in my humble opinion, while Glee's not so much. Hope it gets better writers. Last night's was better than a lot of recent ones, but still only so-so... BTW was quite good as was Keane's, and Finn's I've Got to be Me', but we need better scripts. very little glee in gaga either. she feels like a loser most of the time and she's right! the music industry is about $$$ only. you have to search out the good stuff. the cr@p is in plain sight, constantly being pushed on us and our kids. I want to know where Kurt got that multi-key necklace? the area below the collar where a necktie might normally lie? It was fabulous and got my attention too!!! I enjoyed last night's show. One of the best this season so far. I am so glad Kurt is back and they featured him with an exceptional solo!!! I am hoping Blaine disappears a bit. He is slightly annoying! The message was great but I feel it fell flat in a few places. For example, the story line with Santana, Kurt and Karofskey. I feel this blackmail/bullying was taken a bit to lightly. Santana annoys me though so that probably doesn't help my opinion. I am beginning to like Quinn more and more but I do miss Rachel and Finn as a couple. Lauren ROCKS!!! I enjoy every scene with her! Keep up the good work Glee! Last night’s episode has to be this season’s best yet! It had everything that I love about Glee: Music, Comedy, and Drama! My favorite song was the “I Feel Pretty/Unpretty” mash-up, but my favorite performance was “As If We Never Said Goodbye” by Kurt. It was the perfect “Welcome back!” song for him and the emotion he poured into the performance made it 10 times better. Getting a glimpse into Quinn’s past was very interesting and, surprisingly, I find myself liking her more and more. Strange. Naya Rivera (Santana) has to be one of the most talented, young actresses I’ve seen in a long time, and her lines keep me laughing even after the show’s over. Their T-shirts were genius! It took me minute to figure out Puck’s but it had to do with the “Stupid” decisions he makes with “*downward arrow*” like getting Quinn pregnant! So happy Kurt's back and can't wait to see Prom! Do the writers or editors check their work? I assume they meant the best "lines"
Really?? All the interesting points brought up in this review and you have to point out a tiny typo. Go away troll. Sellout with me oh ya, sellout with me tonight. The record company is gonna give me lots of money and everything will be all right. @RBF- ZOMG! I miss them. Their music is love. I still randomly sing Scot's A Dork when I wake up. @ Evel- you seem to know an awful lot about what "fudge packers" like and don't. Also, you use the words fudge packers so often its beginning to lose its effect. Less and less people are responding to your trolling. STEP IT UP BRO or GTFO! If you're gonna sling and insult at least put some effort into it and make it a good one. Aside from you being seriously lame, it was a good episode. Anything with Kurt I'm happy. Don't even both talkin' at Evel. He never responds and when he does it's so seriously indirect you can tell he's got nothing scathing to say. Seriously, he's just a bunch of overly recycled one liners that fall flat. You ever heard of the "way of the ninja"? Well he studies "the way of the d0uchehole"... he's failing obviously. His insults are like a two day old can of soda, sad and weird. I really liked last night's episode, I thought it was firing on all its engines. Granted, they didn't go gaga over Gaga, rather they saved the one important song for the most important moment. I loved how Kurt and Santana blackmailed Karofsky. I thought that there was character development (Emma and Santana) and all the scheming for Prom Queen made me laugh. I intrepreted it as his crotch makes him make stupid things (age old male excuse). Some of the songs were lesser known?! Are you serious? You've never heard of Sammy Davis Jr.? West Side Story? TLC, one of the biggest girl groups of the 90s? Keane's song was in the US top 50s just a few years ago. Gaga needs to fade out completely. copycat phony.